We sometimes take pictures other than when we're on trips. Pictures that don't fit travel or destinations are found here. To see them, click on an item in the menu or one of the pictures below. After an absence of too many years, we finally got back to the National Zoo. 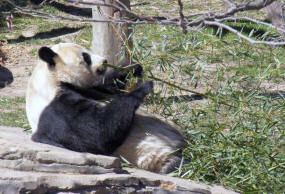 We primarily went to see the baby panda Tai Shan. The pandas are always fun in any event. There's a few pictures from a previous trip as well. The backyard birds are primarily pictures of a house sparrow that moved in to one of our bird houses. Not the ideal bird to have but fun to watch anyway. The little one ran the parent ragged. Bugsy is our miniature schnauzer. He's a pleasure to have around. No tendencies to run off. There's kind of a story about him and several pictures. Rascal was our previous schnauzer. He was much different. High energy and high orneriness. Always into something. He would eat anything he could get into his mouth. Sadly, it caught up with him. His story is both funny and sad.